Unfortunately the combination of the UK ‘Super’ Storm and South West Trains approach to business meant that I couldn’t make the first day of the conference, which was included a series of tutorials. This was a real shame, as I had been eagerly anticipating listening to Thoughtwork’s Neal Ford talking about Continuous Delivery. Thanks to Neal’s website I managed to get hold of the slides, but I’m still gutted that I couldn’t attend. The Java development ecosystem shows the full range of governance available within our industry, from dictatorship (OSGI) to direct democracy (Apache). I thought this was a fun fact! NoSQL is rapidly becoming the de facto datastore of choice – is HDFS the new relational database? Java is the architects choice, the engineers choice, but is it the developers choice? As @monkchips himself noted, it was a slightly tough audience, and I’m not sure why. Maybe the combination of the previous day’s storm and an early start had set everyone up badly? It may be easy to split an application into components, but unless a component maps to a real business process, then it will be difficult to create real meaningful acceptance tests around this. This can lead to overly fragile tests, which simply test technical functionality. Lisa Crispin’s ‘Agile Testing Quadrants’ provide an invaluable insight to the range and value of testing that is available in any software development project. This was a great nugget of wisdom! For the third session I attended one of the Big Data Con talks about the ‘Lambda Architecture’. If you haven’t read about this architectural pattern then it’s worth doing some research, as I’m increasingly seeing this adopted by many of the Big Data shops. Although interesting, I didn’t particularly take away lots to share from this, and so I’ll skip notes here. The fourth session I chose was an explanation (and demo) of the Apache Drill project, which is an open source clone of the much discussed Google Dremel project. The talk was more of a introduction to the project, and so I don’t have lots of notes to share here either. I would recommend having a quick read about Dremel, and also watching a few of the related videos floating around the interweb, as when completed I expect the Apache Drill project to create quite a stir in how we query Big Data sources. For the fifth and final session of day one I attended @sandromacusso‘s talk on ‘Why other people don’t get it’, focussing on how to create a great development team, how to handle situations where ‘they’ (management) just don’t get it, and also how we as developers should take responsibility for ourselves and our careers. Good Developers want a good company. 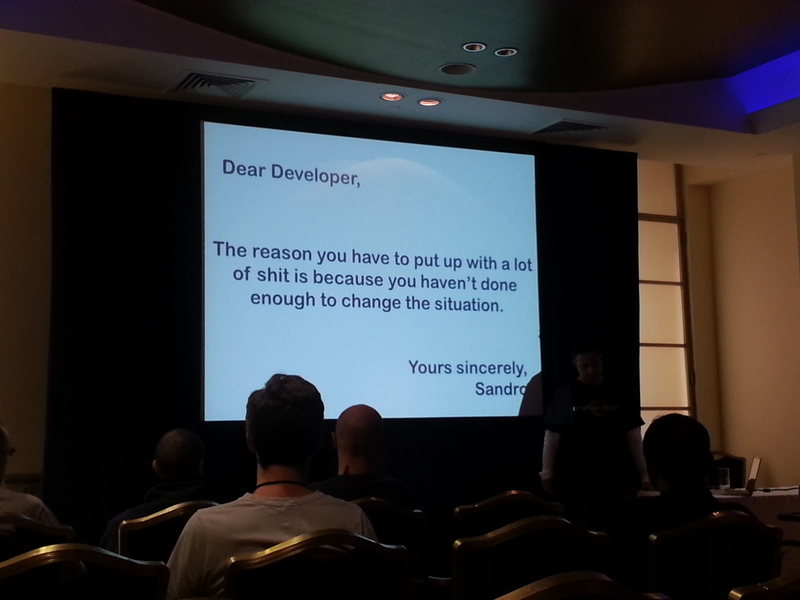 If you’re hiring developers then please remember this obvious but often forgotten fact! How was he nurtured when he got here? TL;DR This is a great book if you are looking for a rapid introduction to Scala (and its idiomatic usage) with a very practical focus. Where else would you be building a Scala-based RESTful API and MongoDB driver within the first few chapters, and more importantly be having fun doing it! ‘Scala in Action’ states that the target audience is open to all levels, but I believe that programmers with some previous exposure to an OO language (especially Java) will get the most benefit. This is not to say novice developers won’t enjoy the book, but they may find it moving at quite a fast pace. ‘Scala in Action’ will offer seasoned developers much to think about, as this book is very focused in teaching you pragmatic (and idiomatic) usage of Scala. The fact that the Scala language manages to blend both Object Oriented and Functional paradigms means that learning this language will provide a great transition into the differing approaches offered by these styles. (Could Scala be considered a ‘gateway’ language? 🙂 ). This makes Scala a great choice for your next language, and the fact that the book encourages idiomatic usage of the language is a great help in fully understanding the power and appropriate application of the language. In addition to the topics mentioned above, this book also covers concurrency using the Actor model with Akka (to which I am becoming more and more of an enthusiast! ), testing and TDD (which I believe is a mandatory topic in any new programming book) and the interoperability between Java and Scala. I haven’t fully digested all of the book yet, and even when I have I’m confident that I will be reading the content several more times (and more imporantly, experimenting even more with the code samples). In summary, ‘Scala in Action’ has been a perfect companion in my first serious voyage into learning this language, and it comes highly recommended for anyone else attempting the same task!